Hassen, Sied, Tagel Gebreheiwot and Tiruwork Arega. 2018. “Energy Policy.” Science Direct 119: 388-395. 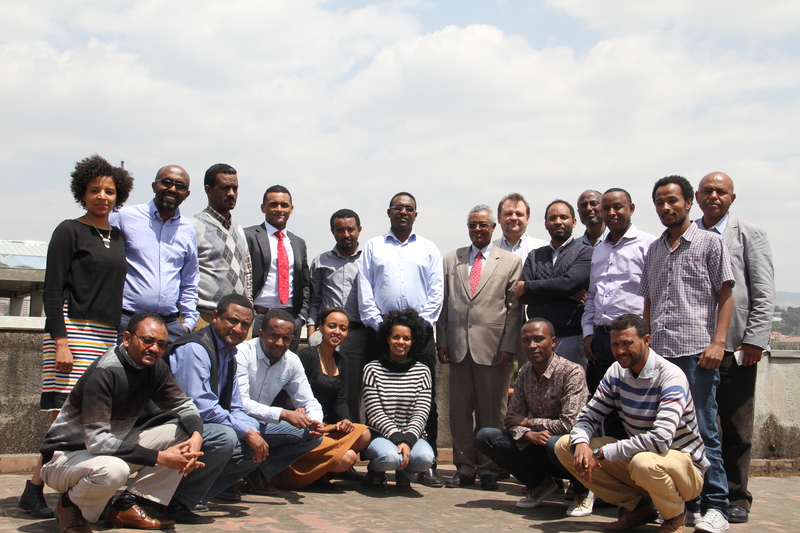 Legese, Getachew, Kristof Van Assche, Till Stelmacher, Hailemariam Teklewold and Girma Kelboro. 2018. “Land Use Policy.” Science Direct 75: 50-59. Teklewold, Hailemariam, Alemu Mekonnen and Gunnar Köhlin. 2018. “Climate change adaptation: a study of multiple climate-smart practices in the Nile Basin of Ethiopia.” Climate and Development : . Alem, Yonas. 2018. “Shocks, Remittances and Household Consumption: A Dynamic System GMM Analysis.” EfD Discussion Paper Series 18-02. Gebreegziabher, Zenebe, Alemu Mekonnen, Tadele Ferede and Gunnar Köhlin. 2018. “Profitability of Bioethanol production: The Case of Ethiopia.” Ethiopian Journal of Economics :forthcoming: . Gebreegziabher, Zenebe, Abebe Damte Beyene, Randall Bluffstone, Peter Martinsson, Alemu Mekonnen and Michael Toman. 2018. “Resource and Energy Economics.” Science Direct 52: 173-185. Hassen, Sied, Tagel Gebreheiwot and Tiruwork Arega. 2018. “Determinants of Enterprises’ Use of Energy Efficient Technologies.” EfD Discussion Paper Series 18-01. Hassen, Sied and Gunnar Köhlin. 2017. “Energy Economics.” Science Direct 68: 133-140. Gebreegziabher, Zenebe, G. Cornelis van Kooten and Daan P van Soest. 2017. “Technological Innovation and Dispersion: Environmental Benefits and the Adoption of Improved Biomass Cookstoves in Tigrai, Northern Ethiopia.” Energy Economics 67: 337-345. Damte Beyene, Abebe, Alemu Mekonnen, Menale Kassie, Salvatore Di Falco and Mintewab Bezabih. 2017. “Determinants of Adoption and Impacts of Sustainable Land Management and Climate Smart Agricultural Practices (SLM-CSA): Panel Data Evidence from the Ethiopian Highlands.” EfD Discussion Paper Series EfD DP 17-10. Hailu, Elias, Mintewab Bezabih and Tadele Ferede. 2017. “The Impact of Credit Constraints and Climatic Factors on Choice of Adaptation Strategies: Evidence from Rural Ethiopia.” EfD Discussion Paper Series EfD DP 17-01. Teklewold, Hailemariam and Alemu Mekonnen. 2017. “Land Use Policy.” Science Direct 67: 449-459. Kahsay, Goytom Abraha and Daniel Osberghaus. 2017. “Storm Damage and Risk Preferences: Panel Evidence from Germany.” Environ Resource Econ : 1-18. Abay, kibrom, Goytom Abraha Kahsay and Guush Berhane. 2017. “Social Networks and Factor Markets: Panel Data Evidence from Ethiopia.” Journal of Development Studies : 1-17. Kahsay, Goytom Abraha and Lars Hansen. 2016. “The effect of climate change and adaptation policy on agricultural production in Eastern Africa.” Ecological Economics 121: 54. Kahsay, Goytom Abraha and Margaret Samahita. 2015. “Pay-What-You-Want pricing schemes: A self-image perspective.” Journal of Behavioral and Experimental Finance 7: 17-28. Teklewold, Hailemariam and Alemu Mekonnen. 2017. “The Tilling of Land in a Changing Climate: Panel Data Evidence from the Nile Basin of Ethiopia.” EfD Discussion Paper Series . Bezabih, Mintewab and Eyerusalem Siba. 2017. “The Land Certification Program and Off-Farm Employment in Ethiopia.” EfD Discussion Paper Series . Gebreheiwot, Tagel and Anne van der Veen . 2015. “Estimating the impact of a food security program by propensity-score matching.” Journal of Development and Agricultural Economics 7:1: 38-47. Gebreheiwot, Tagel and Anne van der Veen . 2014. “Coping with Food Insecurity on a Micro-Scale: Evidence from Ethiopian Rural Households.” Ecology of Food and Nutition 52:2: 214-240. Gebreheiwot, Tagel and Anne van der Veen . 2013. “Climate change vulnerability in Ethiopia: disaggregation of Tigray Region .” Journal of Eastern African Studies 7:4: 607-629.
van der Veen , Anne and Tagel Gebreheiwot. 2011. “Effect of Policy Interventions on Food Security in Tigray, Northern Ethiopia.” Ecology and Society 16:1: . Andersson, Camilla , Mintewab Bezabih and Andrea Mannberg. 2017. “Food Policy.” Science Direct 66: 1-11.